Foodie couples should circle these two fall festivals on their travel calendars to savor gourmet cuisine paired with fabulous wines (and more) – all while enjoying soothing tropical settings that epitomize romance. Barbados Food, Wine and Rum Festival From November 19-22, 2010 you can be the first to sample the unique flavor combos on offer at the inaugural food festival on this charming, Zagat-rated Caribbean island (shown above; courtesy of Barbados Tourism) that also happens to be the birthplace of rum. The four celebrated chefs invited to show off their skills are acclaimed New York chef and “Top Chef” judge Tom Colicchio, award-winning international innovator Marcus Samuelsson, Asian-cuisine impresario and “Simply Ming” host Ming Tsai, and talented Texas chef/restaurateur Tim Love. Events range from a moonlit mingle wine- and rum-tasting with the chefs to hands-on cooking demos to an epicurean extravaganza featuring the invited guest chefs plus top restaurants, such as The Cliff from all around this food-centric island. When you’re not sipping and savoring, you can check out Barbados’ natural beauty with day trips to the boulder-strewn Atlantic coast near Bathsheba, the crystallized limestone formations of Harrison’s Cave, or a catamaran sail to swim with sea turtles. Or, you can always just kick back and catch some rays on the island’s amazingly soft sand beaches. 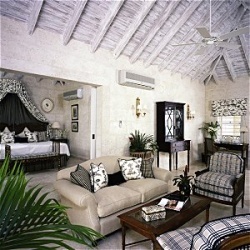 My picks for romantic accommodations: charming Little Good Harbour, from $293/night; historic-meets-modern The Crane, from $403/night; and elegant Coral Reef Club (shown above at right; courtesy of Coral Reef Club) from $440/night. Puerto Vallarta Gourmet Festival From November 11-21, 2010, this romantic Mexican resort region with a stellar list of culinary talent and innovative eateries, celebrates its 16th-annual “gourmet fiesta” of local flavors and dishes. Events are held in a variety of settings, from world-class Puerto Vallarta restaurants such as The River Café and Trio to a variety of bougainvillea-draped beach resorts and include Chef’s Table & Winemaker’s Nights, gourmet cooking demonstrations, and a Gourmet Safari. 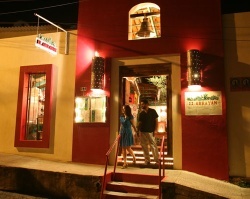 After you’ve digested the gourmet treats, you can shop the atmospheric, boutique-lined streets of Old Puerto Vallarta (shown above at left; courtesy of Puerto Vallarta Tourism) for beaded Huichol figurines, stroll the palm-lined malecon at sunset, or even zipline through the trees on a canopy tour. 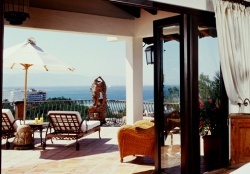 My picks for romantic accommodations: the full-service CasaMagna Marriott Puerto Vallarta Resort & Spa, from $199/night; the atmospheric Hacienda San Angel (shown at right; courtesy of Hacienda San Angel), from $435/night; and the sleek Gran Velas All Suites & Spa Resort, from $575/night. Start planning your next getaway with our Romance Travel Deals. For general trip-planning information, see our Barbados Travel Guide and Puerto Vallarta Travel Guide.